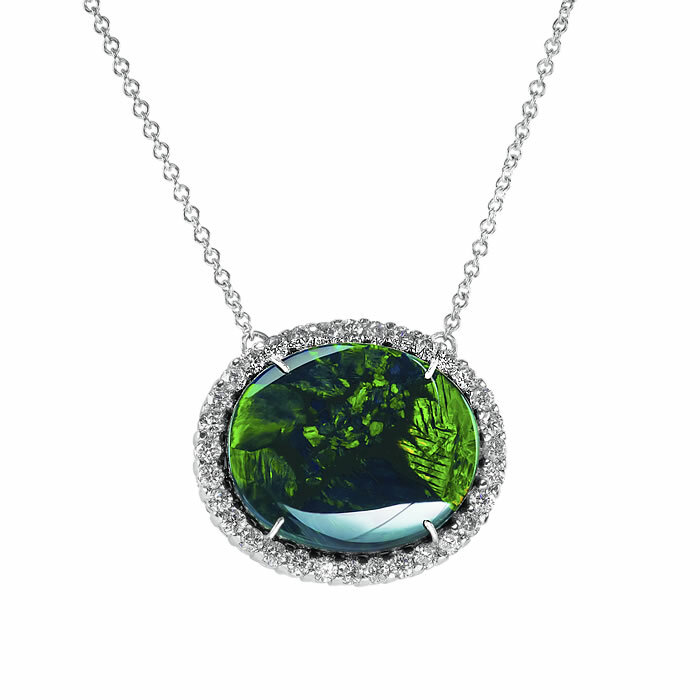 47 carats of gemstones set in platinum. 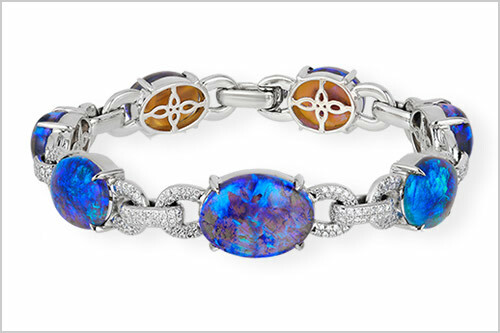 The American Gem Trade Association’s Spectrum Awards are considered the Oscars of the jewelry industry – the most prestigious jewelry and gemstone competition in the world. 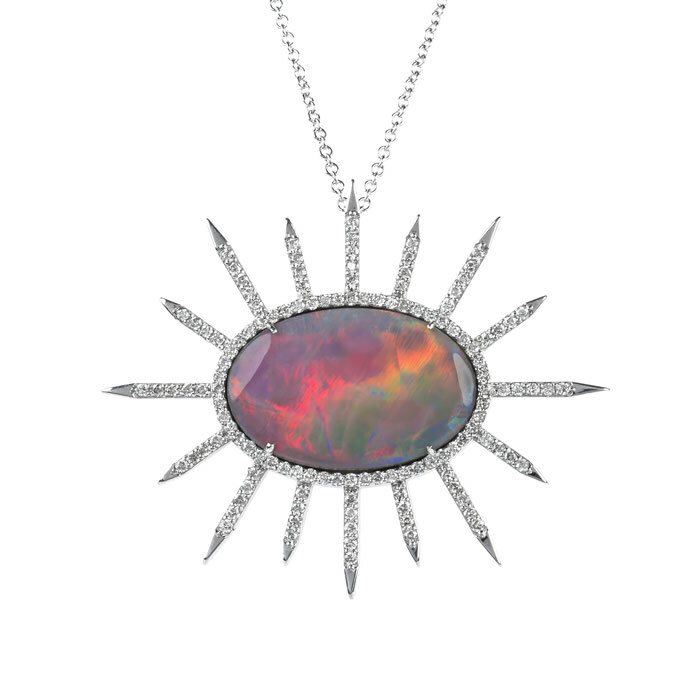 Multi-color Lightning Ridge Opal necklace,10.67 carats accented with 1.07 carats of fine white diamonds set in platinum. 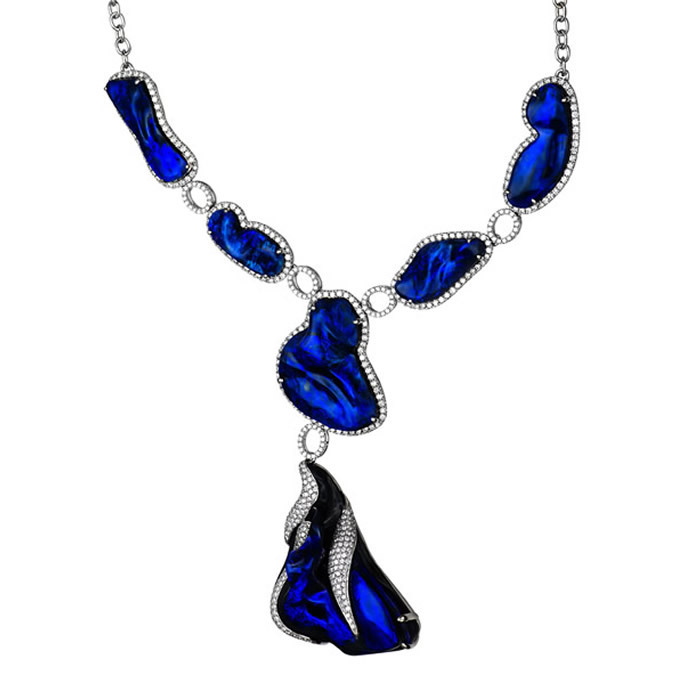 "Electric Blue" black opal and diamond necklace of 197 carets of black opals accented with 6.27 carets of fine white diamonds set in platinum. 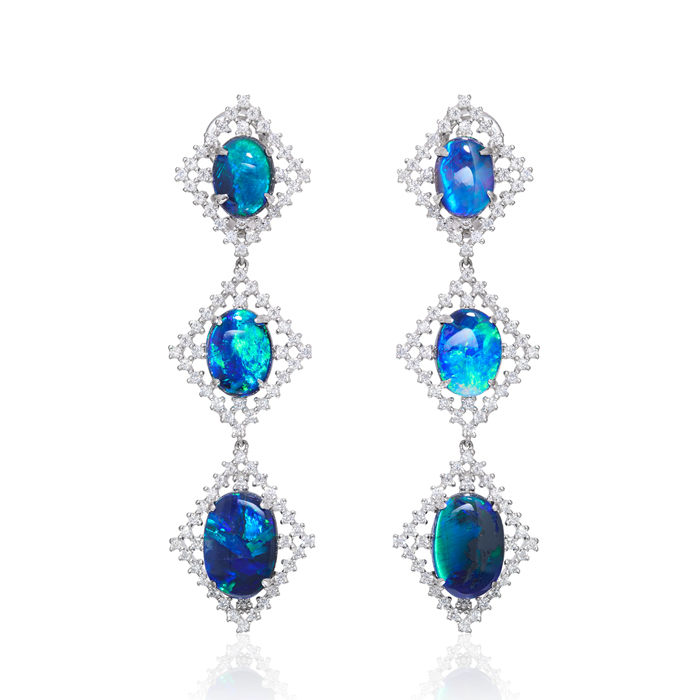 Blue green black opal and diamond earrings, 11.70 carats of black opal accented with 2.00 carats of fine white diamonds set in platinum. 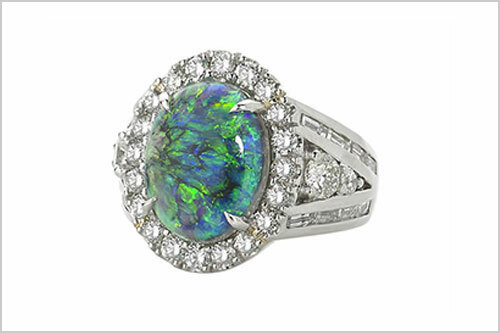 The “Maxine”, a black opal and diamond ring, 5.76 carat oval black opal accented with 2.44 carats of round brilliant and baguette diamonds set in platinum. 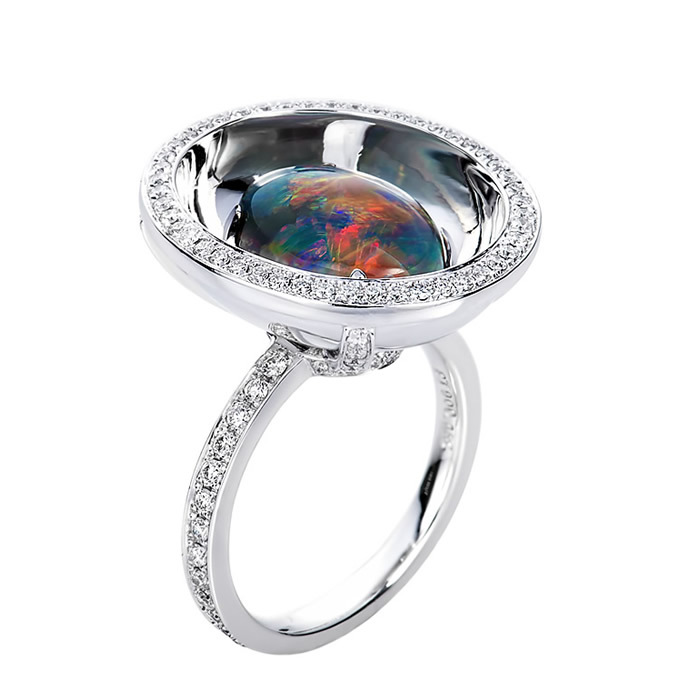 The "Mirror Ring" A black opal and diamond ring, 3.65 caret black opal accented with .69 carets of fine white diamonds set in platinum. 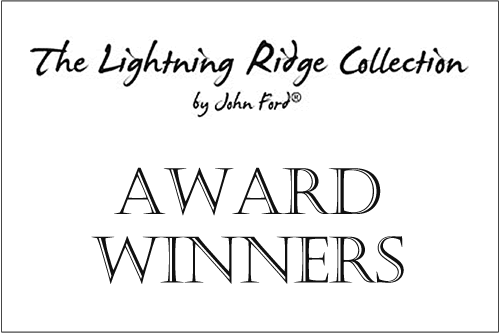 What is the Lightning Ridge Collection? 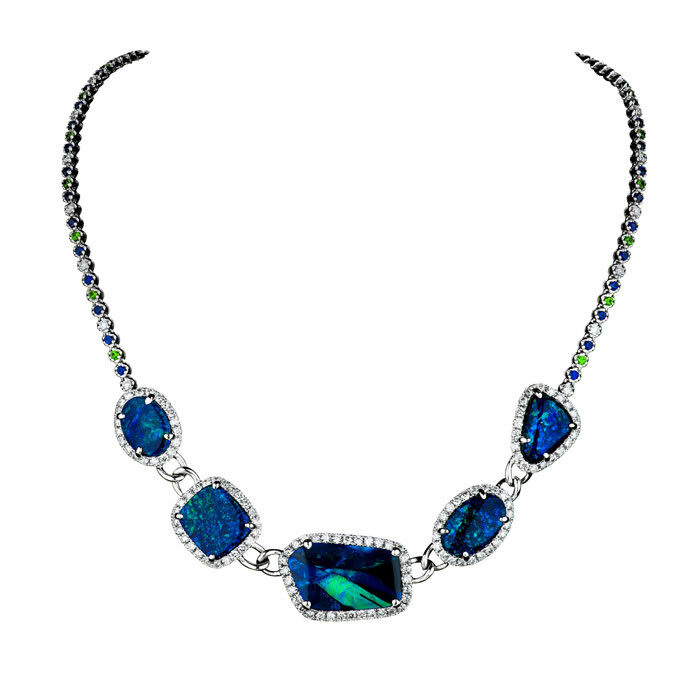 "Electric Blue" black opal and diamond necklace multi 2016 AGTA Spectrum Award Winner Platinum Honors Evening Wear and Buyers Choice Black Opals. 197 carats and 6.27 carats of Diamonds set in platinum. 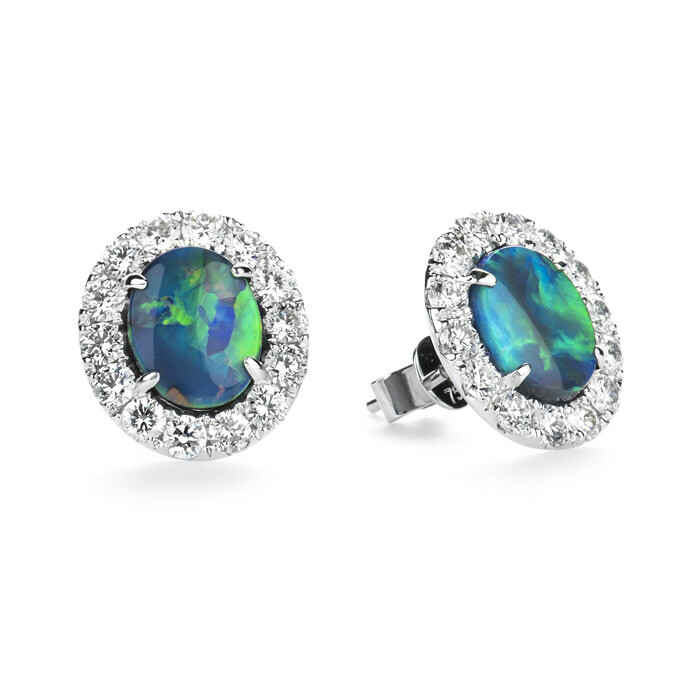 Blue green black opal and diamond earrings. 2017 AGTA Spectrum Awards Winner Evening Wear Platinum Honors. 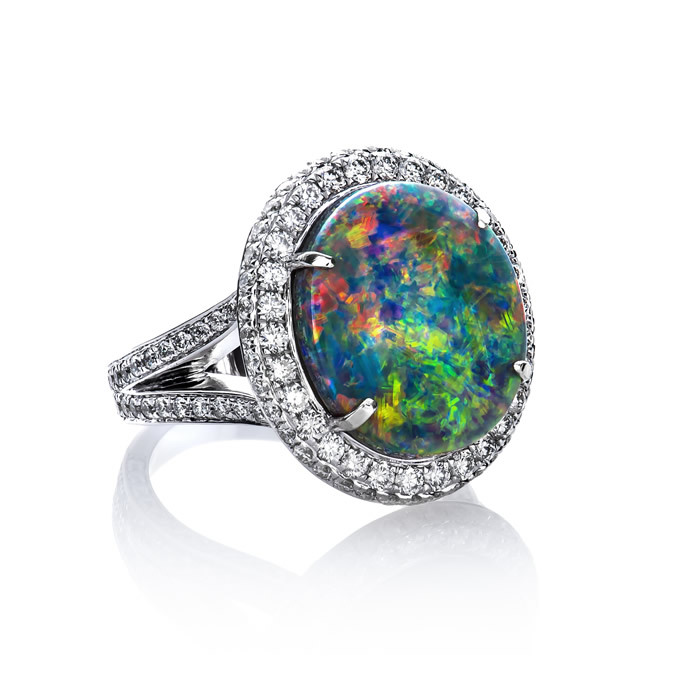 11.70 carats of black opal accented with 2.00 carats of fine white diamonds set in platinum. 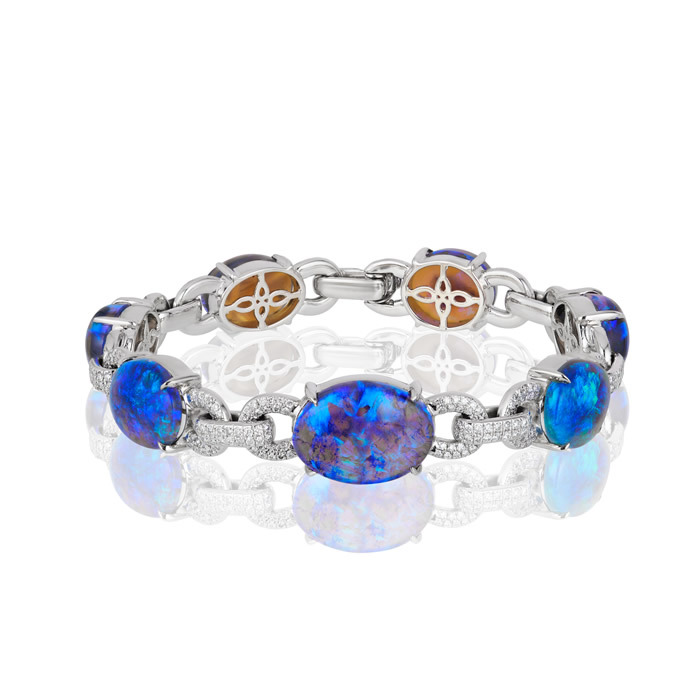 Blue green black opal and diamond bracelet. 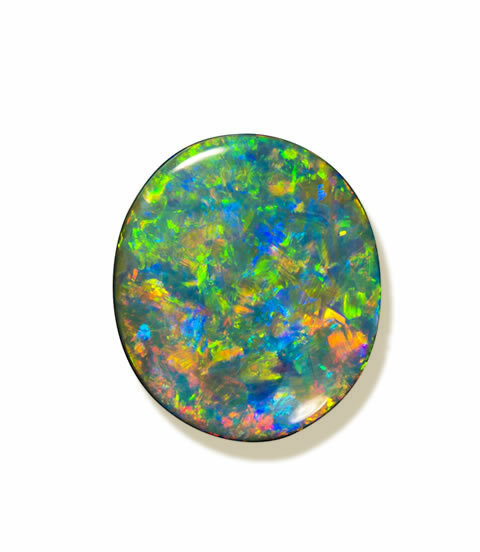 2017 AGTA Spectrum Awards Winner Day Wear Platinum Honors. 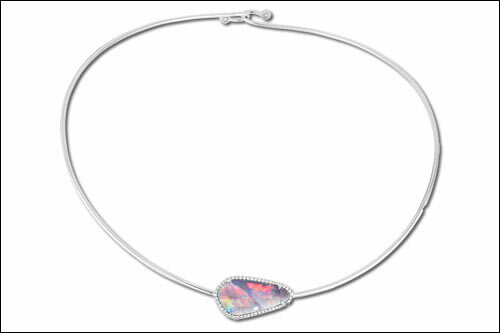 24.02 carats of black opal accented with 1.72 carats of black opals accented with 1.72 carats of fine white diamond set in platinum. 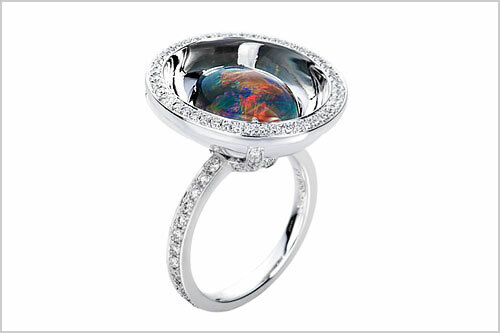 The “Mirror Ring” Black Opal and Diamond Ring. 2016 AGTA Spectrum Award Winner Platinum Honors Day Wear. 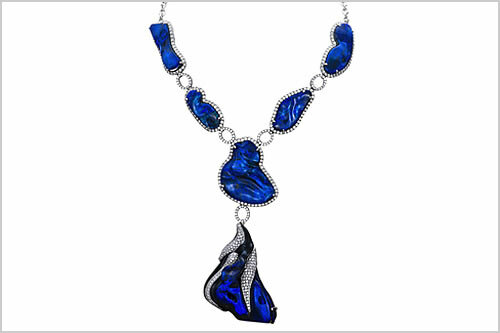 Black Opal 2.56 carats and .69 carats Diamonds set in Platinum. 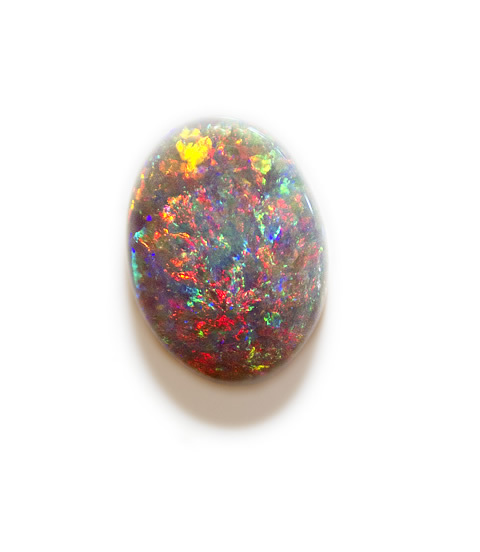 Red Blue Green Yellow Black Opal and Diamond Ring. 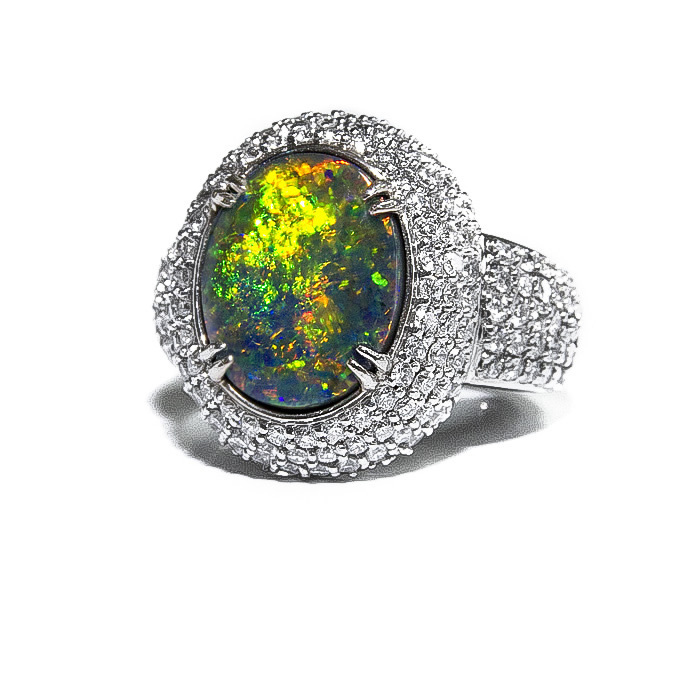 5.92 carats Black Opal and 1.77 carats Diamonds set in 18K White. 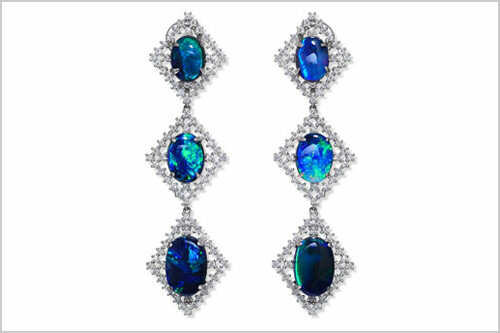 Blue Green Black Opal and Diamond Earrings Black Opals 2.56 carats Black Opal and 1.31 carats of Diamonds Set in 18K White. 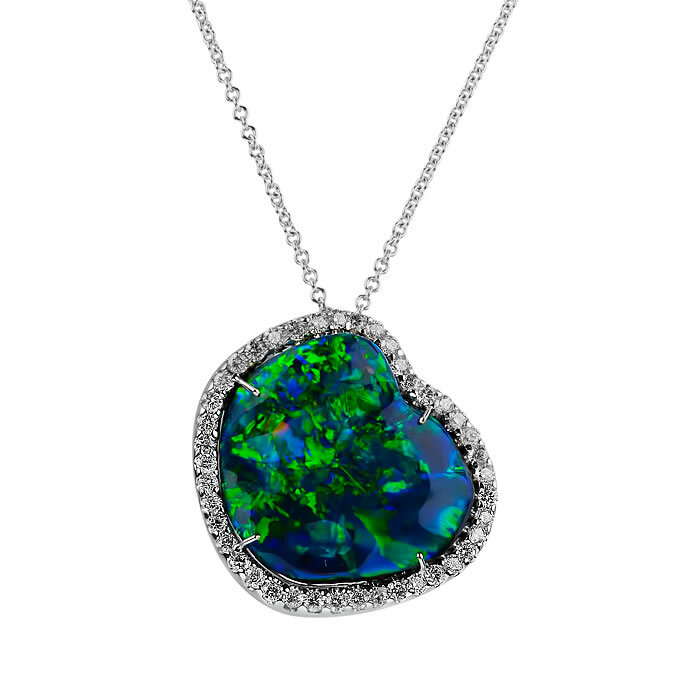 Red Green Blue Black Opal and Diamond Pendant. 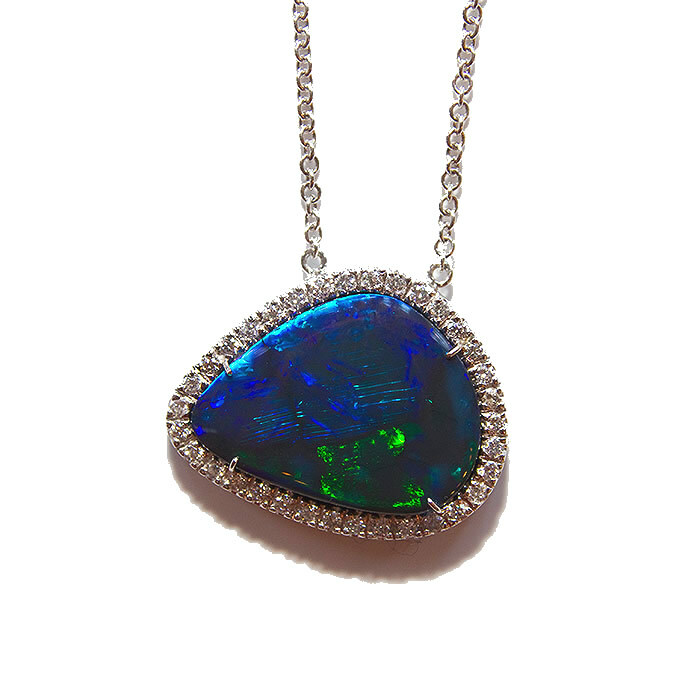 8.50 carats Black Opal and .83 carats Diamonds set in 18K White. 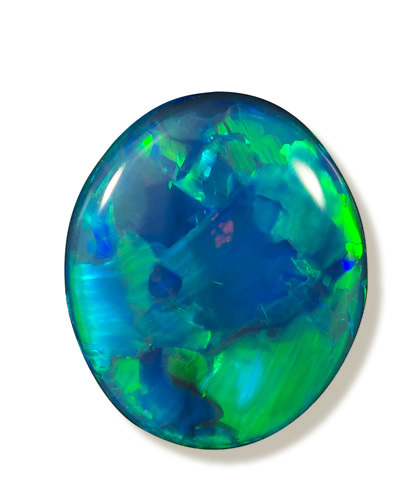 Green Blue Black Opal and Diamond Ring. 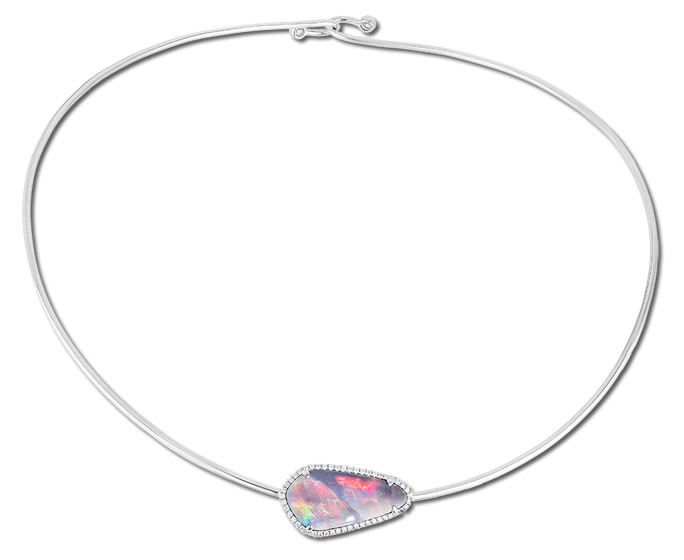 7.14 carats Black Opal and 1.59 carats Diamonds set in 18K White. 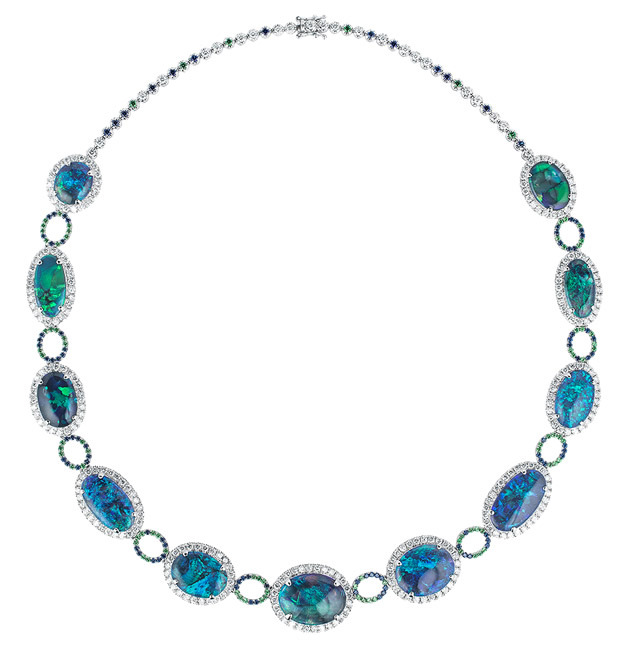 Green Blue Black Opal and Diamond, Saffire and Tsavorite Necklace. 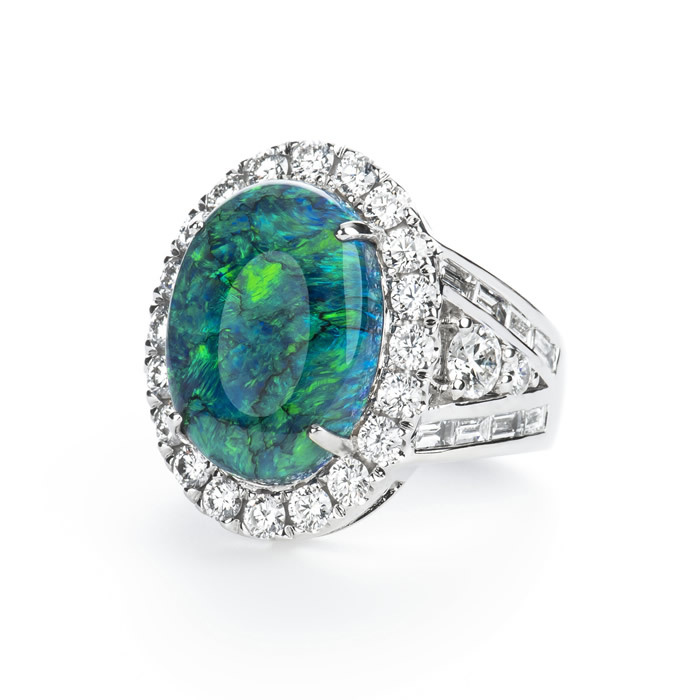 24.14 carats Black Opal, 3.59 carats Diamonds 2.16 carats Saffires and Tsavorites set in Platinum. 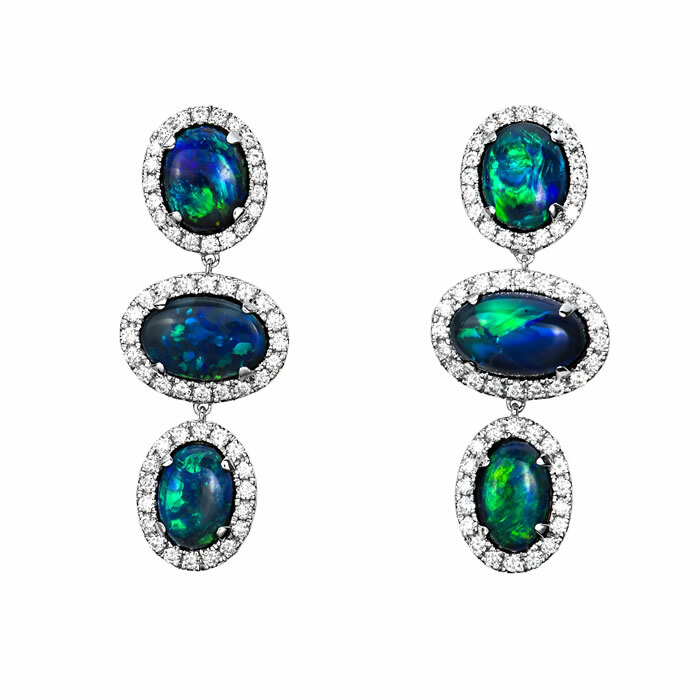 Blue Green Black Opal and Diamond Earrings. 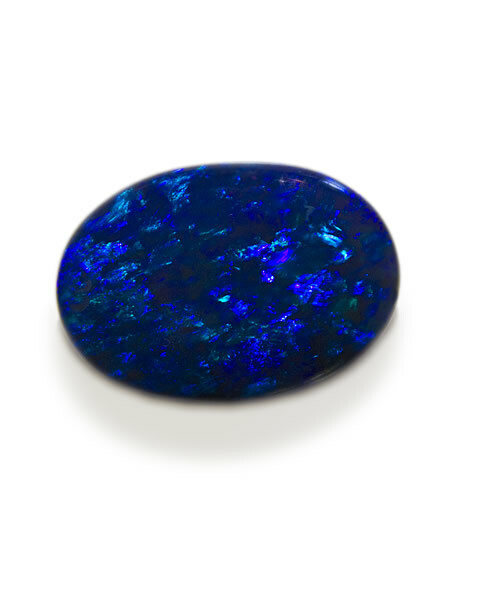 Black Opals 6.87 carats and 1.57 carats of Diamonds. Set in 18K White. 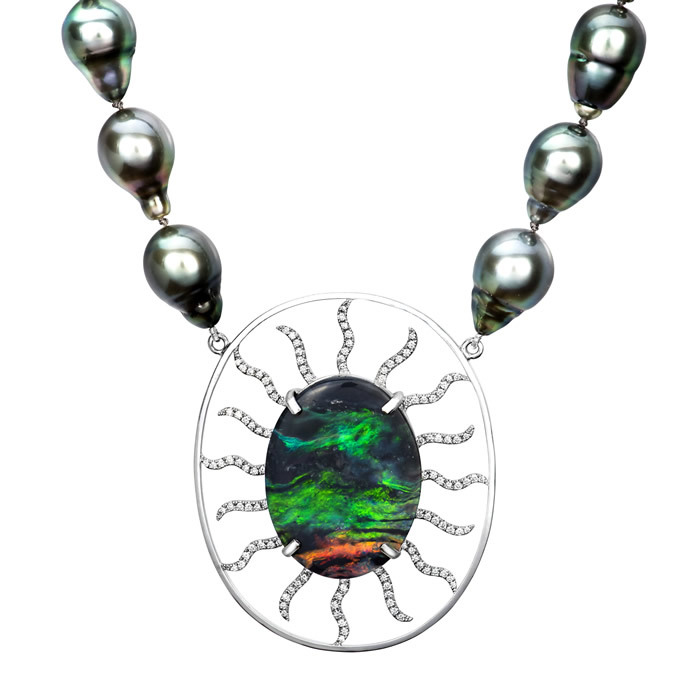 Black Picture Opal “Le Poisson”, Diamonds and Tahitian Pearl Necklace. 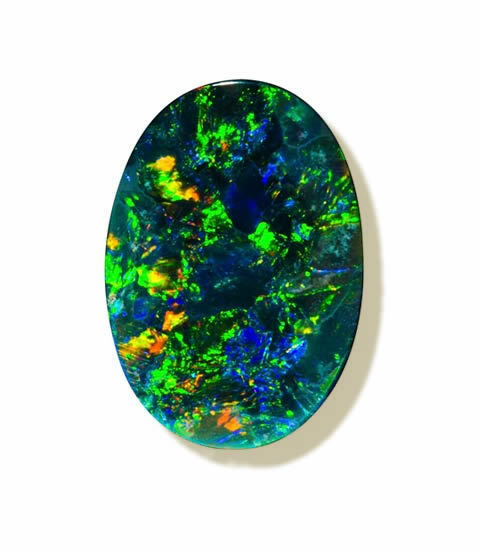 Black Opal 15.04 carats and 1.65 carats of Diamonds. Set in Platinum. 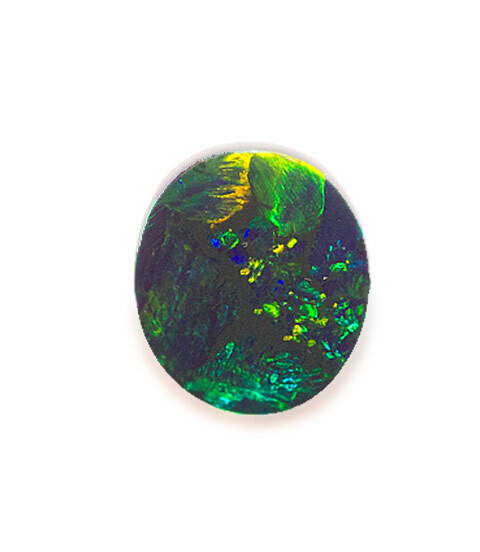 Reminiscent of a rainforest this stunning opal has vivid blues and greens that capture what looks like a nature scape with leaf type patterns dazzling on the top of this 16.45 carat black opal. 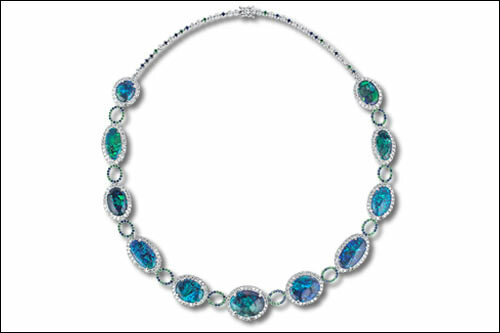 This one of a kind necklace shimmers with 1.33 carats of round brilliant cut diamonds, and is set in 18 karat white gold. 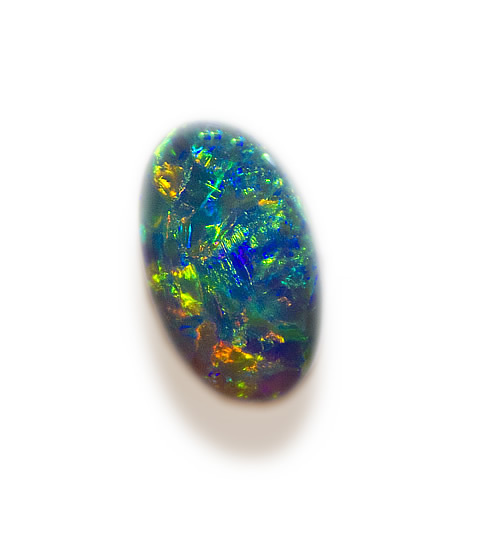 Showcasing a magnificent Freeform black opal weighing 20.80 carats, and absolutely teeming with vivid color, this piece is spectacular. 1.26 carats of round brilliant cut diamonds surround the center stone and the piece is set 18 karat white gold. 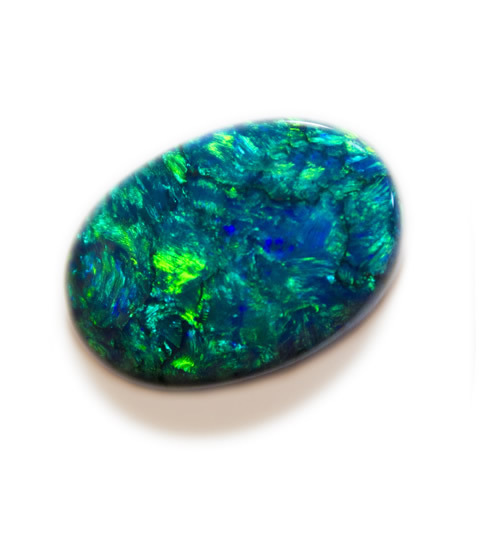 Spectacular blue with broad flash green black opal, nicknamed “The Guitar Pick”, black opal weighs 23.16 carats and is accented by .90 carats of fine white diamonds set in 18k white gold.